Batavia named a “Best Community for Music” for the second time! This award recognizes that Batavia is leading the way with learning opportunities as outlined in the new federal education legislation, the Every Student Succeeds Act (ESSA). ESSA recommends music and the arts as important elements of well-rounded education for all children. 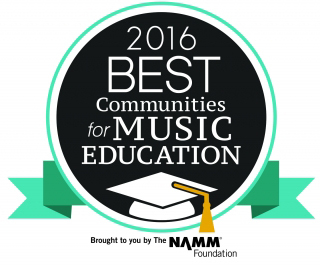 The NAMM Foundation’s Best Communities for Music Education Award and the implementation of the federal ESSA law bring attention to the importance of keeping music education part of the school’s core education for all students. It also highlights music’s vital role in students’ overall success in school. Community music programs have been drawing increased attention because of a study by Northwestern University brain scientists. These researchers found new links between students in community music programs and academic success in subjects such as reading. Beyond the Northwestern study, other reports indicate that learning to play music can boost academic and social skills, such as processing math and learning to cooperate in group settings. A 2015 study, Striking A Chord supported by the NAMM Foundation, also outlines the overwhelming desire by teachers and parents for music education opportunities for all children as part of the school curriculum. BPS101 offers music education from the elementary through high school levels. Approximately 65% of students are involved in some musical ensemble throughout each year. Enrollment numbers have been increasing steadily, and with that has come larger performances and community support. 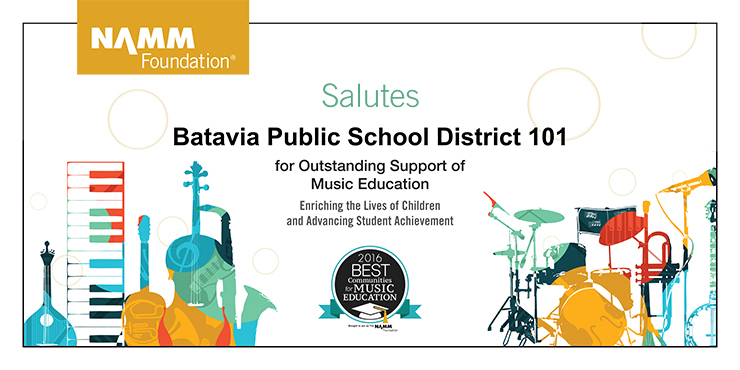 Thank you to all of the music educators for inspiring the lives of Batavia children every day: Peter Barsch, Rob Buckley, Lisa Hatfield, Kate Hillman, Mary Jensen, Laura Lauderdale, Katie McCann, Chris Owen, Keith Ozsvath, Sherry Reiss, Laura Rexilius, Nathan Sackschewsky, Kate Truscello, Rachel Uffelmann, Brian Van Kley, Jamie Vanmersbergen, and Walt Zimmer.